As is so often the case in Japanese animation, displacement and emotional upheaval lead to interaction with the supernatural in the delicate and effective “A Letter to Momo,” finally opening stateside today and expanding over the next month after years building buzz on the festival circuit (it played TIFF in 2011) and even longer in its detailed, hand-drawn production. Writer/director Hiroyuki Okiura last made waves over a decade ago with “Jin-Roh: The Wolf Brigade” but this complex, delicate project took seven years to make and a surprisingly long time to work its way through the international film market to U.S. theaters. With the recent announcement that Studio Ghibli may no longer be creating its own films after the retirement of Hayao Miyazaki and will move on to merely manage its impressive and influential library, fans of this kind of animated storytelling have high hopes for “Momo.” Those expectations are mostly fulfilled thanks to a deep emotional understanding of grief on Okiura’s part and the captivating visuals that accompany the story of a girl who needs some otherworldly help when she’s forced to grow up far too quickly. Momo Miyaura is the Alice of this adventure into Wonderland, an 11-year-old girl forced to relocate with her mother after the passing of her father. Momo and her asthmatic mother move back to mom’s childhood home, an isolated island named Shio, far from the hustle and bustle of Tokyo in which Momo was raised. Momo doesn’t fit in. She’s too frightened to jump in the water with the other local kids. She clutches the letter from her father that he was planning to write just before he died that says merely, “Dear Momo…” What did he want to say to her in his final moments? Will Momo ever know? Or will she be able to stop obsessing over past thoughts unexpressed? Into this emotional upheaval drops three imps from the “Above”—Kawa, Mame and Iwa. Momo is not supposed to be able to see this memorably designed creatures but she can and they become something of a support structure for a girl dealing with the unimaginable grief of losing a parent. She essentially traps them in this world, holding the totem that keeps them here instead of returning to the other side. Giving an 11-year-old control over passage between this world and the next after something as uncontrollable as a father’s death makes for a beautifully connected film on a spiritual level. Overall, Okiura stays very focused on Momo’s emotional journey, which is smart. It’s not as fantastical as “Spirited Away” or many other films about children who encounter the supernatural upon being forced to deal with death, as Momo always stays front and center. The final moments of her journey out of despair are powerfully emotional. In fact, “A Letter to Momo” is more playful than magical. The differentiation in exaggerated design between the three imps that befriend Momo is remarkably effective and their actions are, as is common with magical creatures in Japanese animation, downright childish at times. Kawa fends off a wild boar with a magical fart in slow-motion; the kind of moment that would probably earn a film like this critical scorn for gross-out humor were it in a DreamWorks film but works in the fabric of this piece overall. They dance, lick Momo’s leg for attention, eat like slobs—they’re designed in such a way that they seem more childish than Momo, which is essential to her journey to adulthood through grief. 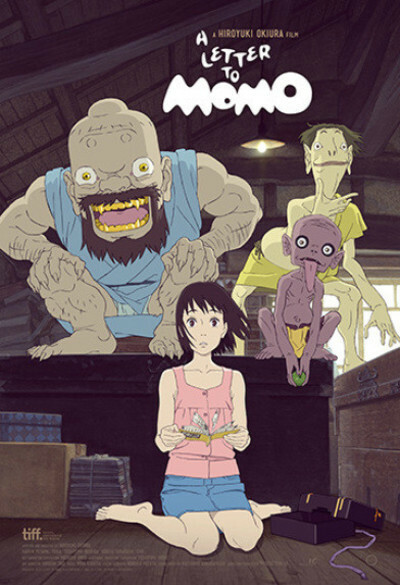 There are times where one feels the two-hour length of “A Letter to Momo,” especially in the over-long first act—it takes almost half an hour for Momo to interact with the imps that will become the backbone of the story. Even scenes that work, such as a climax on a rain-soaked bridge, feel like they could have been trimmed by a few hand-drawn frames. Maybe then it wouldn’t have taken so long for a film this sweet, delicate, and fun to get to U.S. audiences.